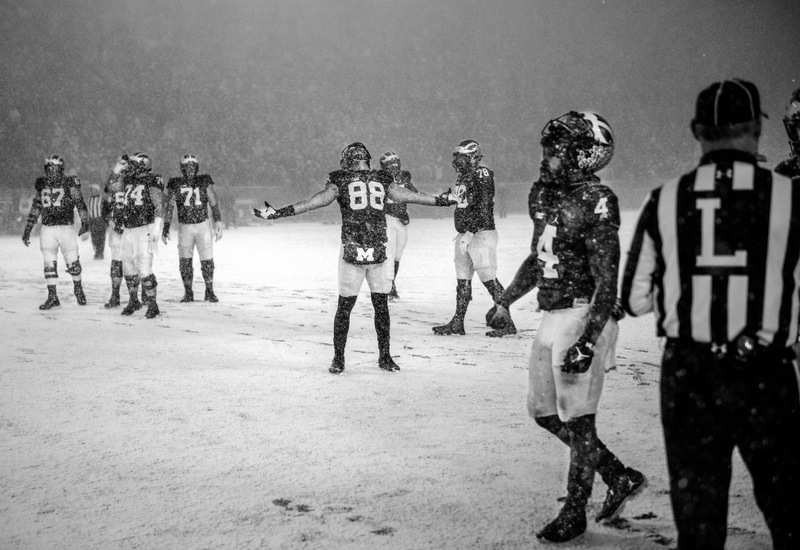 Wrapping up Michigan's snowy 20-10 win over Indiana. The game before "The Game" is always a weird one. You want to look good, but ultimately you just want to win. It's the least anticipated game of the year, but in reality, it's one of the most important. 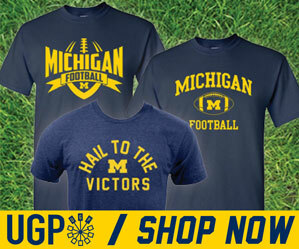 In Michigan's case, it was a must-win. And for about half of the game, it looked like that wasn't going to happen. The first half of this game looked and felt very similar to the second half of the Iowa game. Through the first 30 minutes, Michigan had just 64 rushing yards, 46 passing yards, 4 punts, 3 points and no 3rd down conversions. Just no emotion...no blood going to it. It wasn't until John O'Korn's 30-yard scamper in the 3rd quarter that Michigan even resembled the team that had won 9 games this season. But that run was definitely the spark this offense needed to get things going. On the next play, De'Veon Smith ran 34 yards to the pylon for the go-ahead score, and from then on, it was all but over. Michigan's defense, which was stout for pretty much all of the game, held Indiana in check unlike a year ago. Indiana's lone touchdown drive in which Richard Lagow looked like Tom Brady was really the only time Michigan seemed to be on the ropes. Indiana's 2nd half offense was pretty abysmal...13 rushing yards, 101 passing, 1 of 6 on 3rd down, and just 3 points. A far cry from the output of a year ago. That sets the stage for the showdown in Columbus, which is all Michigan really needed to do on Saturday. Just win. Easy to point to De'Veon Smith here, but I am going to go with the defensive line. A year ago, against a better offense of course, these guys were gashed. This year, not at all. Indiana tried several things, mainly spread plays, but Michigan shut it down. Taco Charlton, Chris Wormley and Ryan Glasgow led the way up front. Glasgow was sorely missed last year and he showed why on Saturday. Taco tweeted out that he's finally feeling 100% with his ankle and all I have to say about that is...sweet! He looked amazing in this game. Peppers had a nice day getting 5 tackles including 2 TFLs and a PBR. Ben Gedeon led the team in tackles with 9 in another strong game for the senior linebacker. We'll talk more about this later this week, but John O'Korn looked...not good...for most of this game. Chalk it up to a lot of factors that sort of all hit at the same time...horrible weather, strong wind, first start, questionable play calling...either way, he looked like a backup QB playing his first meaningful snaps in about 2 years. The Madden drop back, the flinging off the back foot under pressure, that deer in the headlights feeling were all reminiscent of the Devin Gardner days. I was hopeful when O'Korn stepped up into the pocket and took off for that 30 yard run...that's definitely something you won't get from Speight. No one had a good passing game in either the Michigan game or the MSU-OSU game up in East Lansing...so maybe the weather/wind was a bigger factor than we're giving it credit for. No question about this one. The senior running back looked stronger than he's ever looked in a Michigan uniform. When you saw him truck that Indiana defender on his 25 yard run in the 2nd quarter...you had a feeling we'd see more of the same later...and we did. His 158 yards were a career best, and his 2 touchdowns were clutch as Smith alone was responsible for 55% of Michigan's yards. Without him, Michigan would've been in trouble. Smith is not known as the kind of back that typically strings together back-to-back performances like that, so we'll see if this was a flash in the pan, or something more from a senior running back finally seeing the light at the end of the tunnel. He'd been playing well all game, but after he was called for a questionable unsportsmanlike penalty in the 2nd quarter, I think that added fuel to the fire. After that, Taco went off and blew up the next two plays pretty much single-handily. The senior defensive end is making his case for defensive MVP on a team full of defensive stars. He will be a key factor against a young but talented Ohio State offensive line. On a day when trying to punt pass or kick the football was a gamble, Kenny Allen was solid. His 6 punts averaged 41.2 yards, pinned 4 inside the 20 and at least 2 that I can remember inside the 5. His field goals from 28 and 33 were good...not much else you can ask for from a do-it-all kicker on a day like that. I mean, at this point in the season, with the defense playing at the level they're at...how could I pick anyone else? If the mantra "defense wins championships" is going to hold true in Ann Arbor, it will be thanks in large part to the way Don Brown took an already good defense, and made them consistently the best unit on the field in every game Michigan has played this year. It's a huge boost when you're trying to win 2 out of the 3 battles (offense, defense, special teams), when you know your defense is going to show up and give you that edge every time. • Can Michigan Keep Moving Forward?